Tart, zingy and funky, sours are the brews of the moment. F&W’s Megan Krigbaum visits a sour beer visionary. The beer world is one of those delightful realms in which the geekiest ideas can go mainstream very quickly. The most recent style to rise to prominence is sour beer, named for its surprising and undeniable tartness, which is due to some very specific brewing techniques. As a card-carrying member of the I Love High-Acid Wine Club, I’ve found that these beers hit a similar high note—some are subtly tangy and bright, while others are downright puckery and, honestly, a little strange. No matter the type, they’re just as great with food as their wine counterparts are. Monks in Belgium and Germany have long upheld the tradition of sour beer, and brewers there have been perfecting it for centuries. But sours are a fairly recent trend in the US; some established producers (like Russian River Brewing Company in California) are making them their focus, while upstarts (like Westbrook Brewing Company in South Carolina) are just beginning to experiment. All take cues from the classics but go off on their own tangents, helping to evolve the style. 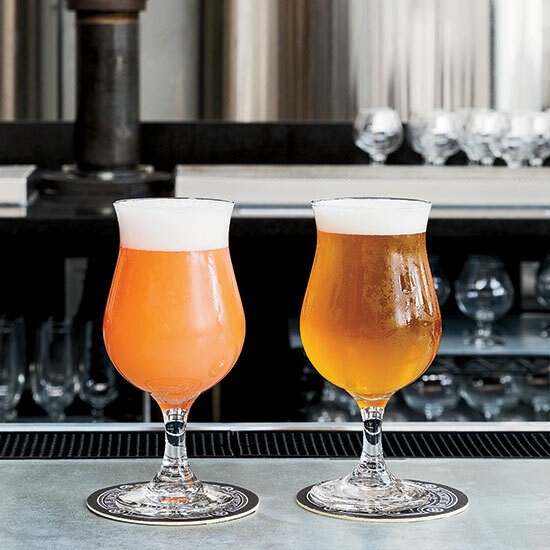 “There’s more artistry to making sour beer,” says Greg Engert, beer director for the Neighborhood Restaurant Group, the company that owns Bluejacket brewery in Washington, DC. “It’s alluring, mysterious and complex. You’re at the mercy of your elements.” Brilliant, history-obsessed Engert is a leader in the beer movement, in general, and in the sour beer movement specifically. At Bluejacket, he and his team have created more than 70 brews just in the past year, many of them sours. These run the stylistic gamut from the citrusy, lightly smoky Pyro to Moby Grape, an imperial sour brown ale that’s intensely tart but also malty and mapley. I’d taken the train down to visit Engert and to try his beers where they’re made. The year-old brewery in DC’s long-neglected Navy Yard is in an enormous old factory that used to make boilers for ships. The three-story building, with sunlight streaming in through walls of windows, is at once beautiful and industrial. One half is filled with shiny stainless tanks and fermenters, and the other half is a restaurant, The Arsenal, where dozens of tap pulls line the magnificent studded zinc bar. The wafting aroma of bready malts is a constant everywhere. Engert, in black jeans and tie (both skinny), bolted up and down the stairs of the brewery, and I chased after, dodging tanks and miles of hoses, glass in hand. Although he’s not a brewer—there’s a three-person team that handles all that—Engert checked the temperature of every tank and described for me, in minute detail, where all those hoses were headed. I kept thinking, Yeah, yeah, I’ve seen a brewery before. But then we sort of snuck up another set of stairs—and that’s where the magic was happening. In a corner of the second floor, Engert has devoted three rooms to making sour beer. One is a sealed-off space that holds an 18-foot-long, two-foot-deep stainless steel tub—a piece of equipment with a name as wacky as the beers it makes: coolship. The horizontal tank, used most often by Belgium’s lambic brewers, is important in making a specific kind of sour. Many sour beer brewers eschew commercial, cultured yeasts and instead encourage wild yeasts to kick off what they call spontaneous fermentation. The result is beer with a sort of brewery terroir. At Bluejacket, brewers throw open windows near the coolship so that all of the airborne yeasts of DC can float in and ferment the beer. The ceiling is even made of microbe-friendly cedar to encourage those yeasts to take up residence. The tanginess in sour beer comes from some icky-sounding but flavor-making varieties of bacteria called lactobacillus and pediococcus. While most breweries spend a lot of energy keeping bacteria out of their beers, some brewers desire it. At Bluejacket, the bacteria is grown in a tiny test lab and added to the brew during fermentation. In a little room next to the lab, Engert ages some of his sour beers in oak barrels, most of which previously held wine or whiskey. He pointed out specific barrels: “This one is from my Napa winemaker friend Sean Larkin, and this one was used to make James E. Pepper rye.” The barrels help amp up the funkiness and deepen the flavors of the sours, some of which will be aged for three or four years before release. Downstairs, in The Arsenal, chef Kyle Bailey makes dishes that are spectacular with sour beer. The restaurant’s location in the center of the beer-making action gives Bailey and Bluejacket’s brewers the opportunity to exchange ideas. They have found that there’s a sour pairing for pretty much any dish. Bailey’s crispy smoked-trout flatbread (p. 92) is delicious with a crisper sour; a rich, nutty chicken tagliatelle pairs better with a darker one. Often, Bailey uses the beer, rather than citrus or vinegar, to add tanginess to a dish. After tracing the path of sour beer from the tank all the way through the tap lines, I spent the afternoon sitting at the bar with about a dozen samples in front of me–and nearly as many dishes—and I didn’t miss my high-acid wines one bit.